The No. 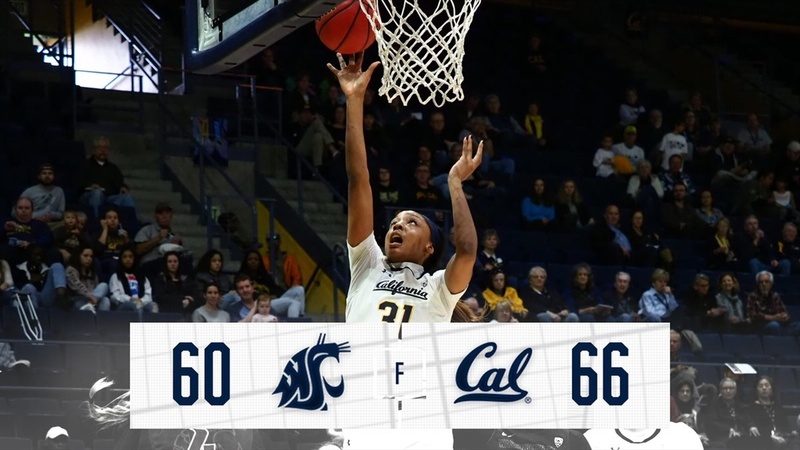 24 California Golden Bears earned the important weekend home sweep, beating Washington State 66-60. Kristine Anigwe was tremendous all game, collecting 30 points and 17 rebounds. It was a hard-fought game, with 16 lead changes. Neither team led by more than six points. Freshman Kianna Smith contributed nine points and seven rebounds as Cal dominated the glass 45-30. Mikayla Cowling had a game-high seven assists. Asha Thomas again came up big at the end of the game. The junior, who had eight points, came up with a huge steal and hit four free throws in the last 15 seconds to ensure the win. Borislava Hristova, the reigning Pac 12 player of the week and scoring leader, matched Anigwe basket for basket throughout the game. Hristova had 25 to lead the way for the Cougars, including three treys as WSU hit eight from distance to keep pace with Cal’s inside game. Cal is now 4-2 in the Pac-12 (13-4 overall). Washington State is 1-5 (8-10 overall). Kristine Anigwe opened the scoring, splitting free-throws. Washington pressured the perimeter, then collapsed down low, triple-teaming Anigwe into a turnover. Penina Davidson picked up a loose ball rebound and put it back. After missing their first four attempts, the Cougars tied the game on a three by Louise Brown. Another three, this one by leading scorer Borislava Hristova, brought WSU their first lead, 8-7. Cal continuing to find Anigwe down low, scoring seven of Cal’s first nine. Cal showed terrific hustle early. Mikayla Cowling dug out a steal at mid-court, and while falling down, had the presence of mind to fling the ball ahead to a streaking Jaelyn Brown for a score. Asha Thomas then called her own number, and her twisting, high arcing lay-up gave Cal the 13-8 edge. The Bears got a little sloppy on offense, and the Cougars soon tied the game at 13. CJ West gave Cal a lift, posting up strong and demanding the ball. Her two baskets, plus one more by Anigwe, put Cal ahead 19-13. But WSU zapped that momentum, hitting a three and then tying up the ball on the ensuing Cal inbound. Chanel Molina hit a deep two at the buzzer, and Cal’s lead was only 19-18 after one. Cal missed a series of point-blank shots and long jumpers to open the second, and WSU gained the lead on Hristova’s jumper. Penina Davidson was called for an unsportsmanlike conduct technical, and Hristova hit both free-throws. Nike McClure’s jumper extended the Cougar lead to 24-19. With Cal’s offense again bogged down, Kianna Smith squeezed into the lane and hit a runner. It was Cal’s first basket in four and a half minutes. A jumper and a three from Hristova extended the lead to 31-25. As she did Friday night, Cowling hit a pull up jumper to get the Bears untracked. Anigwe beat the double team with a pass to Davidson for a basket, then scored on her own to tie the game. A free-throw by Davidson closed the half with the Cal 7-0 run and left the Bears ahead 32-31. WSU took the lead back on Caila Hayley’s two free throws to open the third. But the Bears went right back to Anigwe for two quick scores, and the Cougars were forced into a time-out. Hristova continued to show off her deadly offensive variety, scoring inside and then hitting a three, tying the game at 38, with 5:51 left in the third. The teams traded the lead for the next several minutes. Chanel Molina withstood tough Cal defense and hit a three at the shot clock buzzer, with a hand in her face. It was Molina’s second three of the quarter, and the Cougars took the 48-45 lead into the fourth quarter. Pinelopi Pavlopoulou opened the fourth cutting to the basket, and her score extended the WSU lead to 50-45. Jaelyn Brown curled to the free throw line for a jumper, and Anigwe hit again down low. Kianna Smith hit 2 free throws, and the Bears edged back ahead 51-50. Brown was called for a foul clearing out the defensive rebound, giving the ball back to Washington State, and Hristova made good on the opportunity, hitting a short jumper. After consecutive empty possessions trying to get the ball to Anigwe, the Bears found Smith open in the corner, and the freshman knocked down a three. It was Cal’s first make beyond the arc, and it put Cal ahead 54-52, with 5:42 to go. Anigwe crashed the glass hard, earning fouls and hitting a free throw. But Washington was undeterred. The Cougars attacked the rim, forcing help defense, and then finding the open player. Louise Brown benefitted, hitting a three and a basket inside. The Bears tied the game on Cowling’s long jumper, and then edged ahead on Thomas’ two free throws. WSU came right back, with McClure following up her missed free-throw with a putback. Anigwe tied the game at 60 with a free-throw, with 1:40 to play. With 49 seconds to play, Cal called time. The Bears’ offense went nowhere, and Gottlieb burned another stoppage. This time, Smith got into the lane and found Anigwe underneath. Bears up 62-60. With 27.2 left on the clock, Washington State called time to design one last play. The Bears played terrific defense, fighting off screens and deny cuts. With nowhere to go, the Cougars mishandled the ball up top, and Asha Thomas scooped up the steal. Thomas hit two free-throws with 13.3 to go, giving Cal the crucial two-possession lead, 64-60. Hristova missed a long three. Anigwe secured the rebound, and the Bears called time, advancing the ball. Thomas was fouled again, and again, she hit both. Cowling stole the inbound pass to wrap up the exciting win. · Gottlieb opened the press conference with, “We trained really hard for today. We put in the hours. There were fits and spurts of adversity, but at end, we know that toughness would come through. And those are my comments on the baby race.” Gottlieb’s 8-month old son Jordan represented Cal in the half time baby race and easily out-distanced his competitor.